Discover a berry pavlova that's a cinch to make! 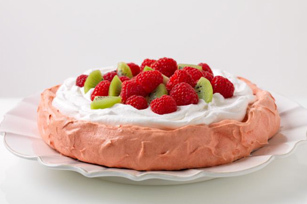 Watch our video to learn how to make Raspberry Pavlova, featuring raspberry-flavored JELL-O. Combine sugar and dry gelatin mix. Beat egg whites in medium bowl with mixer on high speed 5 min. or until soft peaks form. Add sugar mixture, 1 Tbsp. at a time, beating constantly until stiff peaks form. Gently stir in cornstarch and lemon juice until blended. Spread into 8-inch round on parchment-covered baking sheet. For best results, prepare meringue on a cool dry day. High humidity can result in a chewy sticky meringue. Top with COOL WHIP and fruit as directed just before serving. The crisp meringue crust, with its light and airy center, adds a great contrast in textures to this delicious, yet fat-free, dessert. And as a bonus, the fresh berries add both a blast of color and irresistible sweetness to this showstopping dessert..